Advanced Info Service Plc. opened a new service center in Pattaya where customers can not only maintain their mobile services account, but pay utility bills as well. 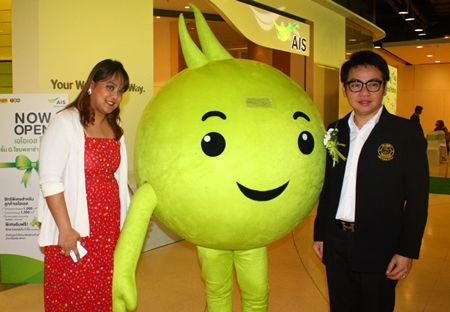 The new AIS Shop, opened on the mall’s ground floor Nov. 6 by deputy customer service director Vilasinee Phuttikarnrat and Pattaya Deputy Mayor Verawat Khakhay, is dubbed a “total experience” store where AIS customers can pay bills, try new technology and even pay electricity and water bills. Celebrity Saran “Porch” Sirilak was also on hand for the grand opening. The new store also features a “Try & Buy” zone where customers can get hands on with the latest gadgets and get advice in shopping for smartphones. (L to R) Sakchai Pitivittayakorn, assistant MD, Deputy Mayor Verawat Khakhay, Vilasinee Phuttikarnrat, deputy MD of AIS Customer Services, Saran Tantijumnan, director of Region 3 and acting general manager of Central Festival Pattaya Beach, and Saran Porch Sirilak officially open the new AIS Shop. Previous articleWhere to from here? Next article“Eggzactly”! Sunny Side up!